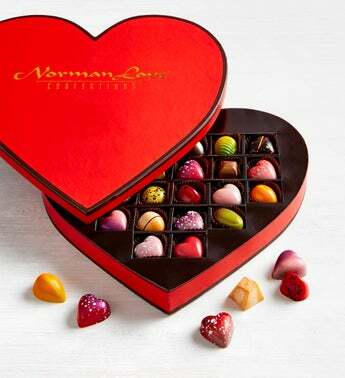 Show your love in the most impressive and decadent way with this beautiful collection of Valentine's Day ganache filled chocolates from renowned and award-winning chocolatier Norman Love! This 24 piece premium heart gift box includes 10 limited edition 2019 heart shaped chocolates with "forgotten love" favorite flavors including New York Cheesecake, Kahlua, Cinnamon Roll, and Passion, along with 14 stunning chocolates from Norman Love Confections' signature collection. Your sweetheart will be wowed with the to-die-for ganache flavors including Peanut Butter & Jelly, Strawberry Cheesecake, and German Chocolate Cake. Total Net Weight 11 oz.